For the June Daring Bakers' challenge, Mandy of What The Fruitcake?! came to our rescue last minute to present us with the Battenberg Cake challenge! She highlighted Mary Berry’s techniques and recipes to allow us to create this unique little cake with ease. This cake has far grander beginnings than tea with teddy. It was actually created as a wedding cake for royalty. The first Battenberg cake was made to celebrate the marriage of Queen Victoria’s granddaughter, Princess Victoria, to husband Prince Louis of Battenberg. It’s traditionally flavored with almond and has the signature Battenberg markings, that is, the yellow and pink squares (said to represent the four princes of Battenberg). The strips of sponge are glued together using jam (normally apricot) and the whole cake is covered in marzipan. Sometimes the edges are crimped and the top is patterned with a knife. Although there are specialized Battenberg cake tins available, you don’t need one. This cake can be baked in a square baking tin and a divide made with foil to separate the two batters. This recipe really is all about simplicity. 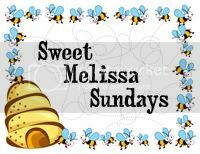 Thanks Mandy, for hosting this month's challenge. You'll find the recipe below. Also be sure to check out the Daring Bakers' Blogroll to see what everyone else thought of these beautiful and impressive cakes! 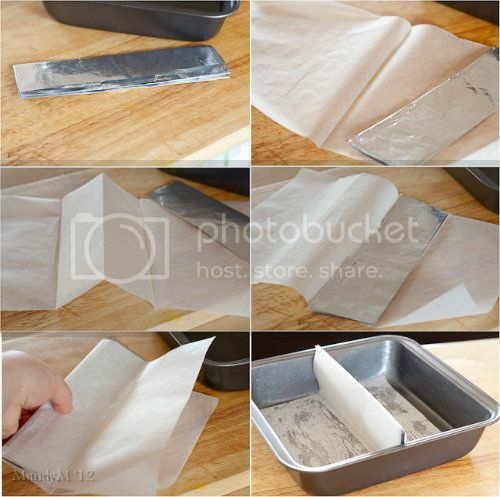 Making the pan divider with parchment paper and foil. I folded over a sheet of foil several times to help reinforce the divide. Fold the parchment in half and put the foil into the crease. Butter the bottom of the cake pan, this will help "glue" the parchment to it. Make sure the divide is in the middle of the pan and stick the excess parchment onto the bottom.